With the Wireless USB Adapter 54g you can establish a connection with any 2.4 GHz compatible wireless network. 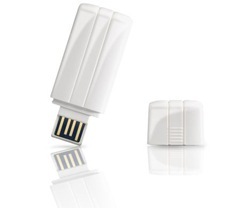 The USB adapter can be plugged into a desktop PC or notebook which has a free USB 2.0 port. The wireless USB adapter can communicate directly with another wireless network card in an Ad-Hoc network or can be hooked into a wireless network featuring an access point. If a wireless network uses several access points, this wireless USB adapter automatically chooses the strongest signal (roaming).